Here's a nifty sampler pack to try all 7 amazing sprouted pili nut versions from Pure Traditions. You'll get one 1.7 oz size bag each of Apple Spice, Chili Garlic, Himalayan Salt, Pizza, Ranch, Turmeric Blend and Unsalted. A great way to find your favorites! 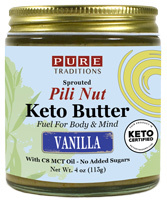 Pili Nuts (pronounced "PEE-lee") contain the highest amount of fat and lowest carbs of any nut. Perfectly suited for low carb and ketogenic lifestyles, pili nuts are high in Magnesium, Vitamin B-1, and Manganese. These raw nuts have a delicious buttery taste and are pre-sprouted for optimal digestability. The high quality fat content will help keep your brain and body well fueled and hunger in check. Pure Traditions Pili Nuts are grown without synthetic fertilizers and never sprayed with pesticides. We work only with high integrity suppliers who focus on transparency and sustainability.